I have 3 words for you: GIANT COLORFUL SNOWFLAKES. A dream? Nope! 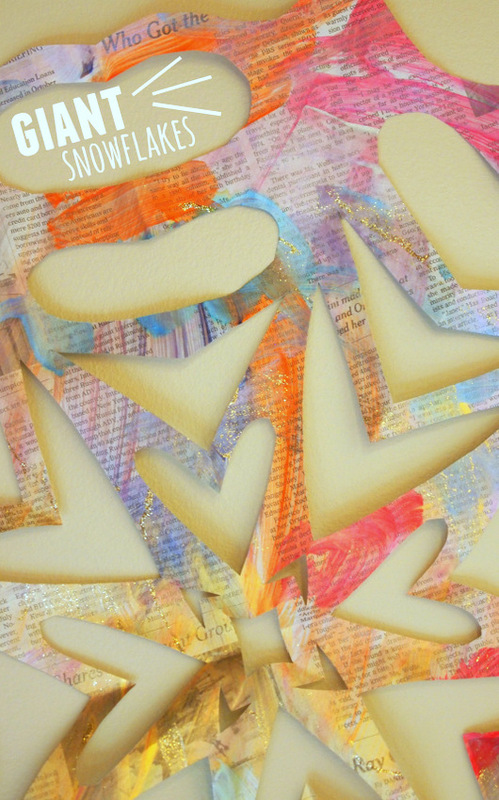 These gorgeous snowflakes are simple to make and a great way to showcase your child's artwork too! As you probably know, I love simple origami, kirigami, and paper cutting crafts. There's just so much creative possibility when crafting with a plain, sheet of paper. Every year I cut out snowflakes to decorate our home and this year I figured I'd play around with scale. Let's Make Giant Painted Snowflakes! First, I covered our work area. Then, we grabbed some newspaper and brown paper bags. I cut open the brown paper bags so we'd have a nice, flat painting surface. And then we went to town squirting, painting and rolling! My preschooler and I painted alongside each other. He really enjoyed using the brayer, and just squeezed the paint and glitter glue directly onto his brown paper bag. We let everything dry overnight. Then, I took the paper and cut them into snowflakes! Can you tell that we're on a gold and sparkly streak over here? I love how gorgeous the paint looks on brown paper! Currently our giant snowflakes are adorning our dining room wall. I hope you have a wonderful time trying out this craft with your kids too! And if you're looking for more snowflake activities, check out the links below! You can always find more fun ideas on my Pinterest, Facebook, or Instagram accounts!